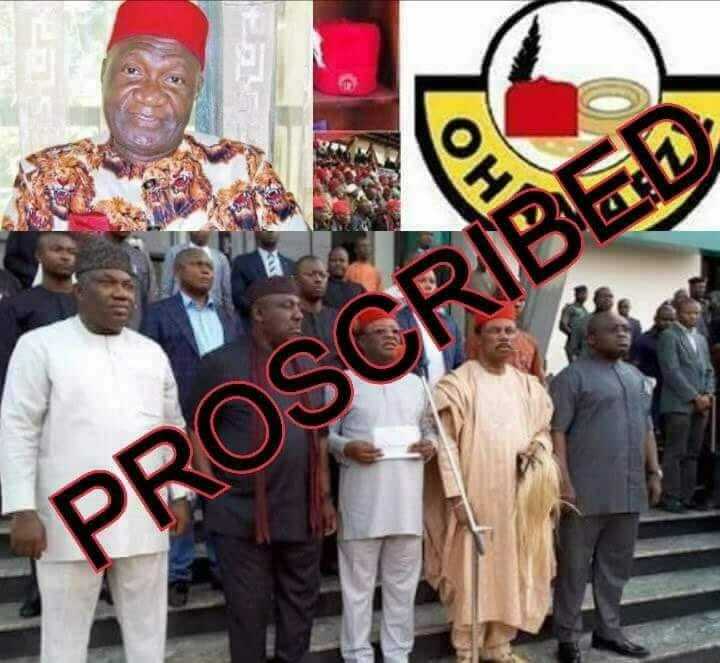 The proscription of activities of Ohaneze Ndigbo socio-cultural group and self-serving politicians in the Southeast by the leadership of the Indigenous People of Biafra (IPOB), ably led by Mazi Nnamdi Kanu is one of the greatest landmarks of this courageous, bold, highly enlightened, civilised and peaceful indigenous mass movement of our time. This development stems from the criminality of the so-called Igbo leaders/elders who in connivance with the Hausa-Fulani oligarchy spanning over decades of unrepentant dehumanizing practices being foisted on the indigenous people of the old Eastern region. This is a region created by the occupational government of Nigeria with the principal intent to permanently "divide and rule" the people partitioned into the so-called South-East and South-South regions purely on British advice. Meanwhile, the wave of subjugation, marginalization, killing, betrayal and dehumanization exerted on the people have been effectively orchestrated by the slavish and self-serving activities of these men who claim to be representatives of Easterners, on the platform of diverse political colorations of the British contrapted Nigeria. Following the atrocious war waged against Biafrans between 1967 and 1970, the British sponsored military Constitution handed down to the inhabitants of Nigeria in 1999, has a designation of effectively crafted ploy to permanently scheme out the INDIGENOUS PEOPLE OF THE OLD EASTERN REGION from accessing the political office as Nigerian President. It also mortgages the rights of possible political office holders by absolutely remaining dafts to the questionable demands of the Northern Islamic Oligarchy, at the detriment of the people. All the politicians of Biafra extraction, have become so helplessly and permanently subservient to their Hausa-Fulani slavemasters who give them appointments under serious bargains. The Indigenous People of Biafra (IPOB) under the leadership of Mazi Nnamdi Kanu, haven foreseen the impending eternal pauperization and enslavement of the indigenous owners of the land of Biafra, decided to stake their lives and destinies in the total liberation drive of their people. This however was at variance with the agenda of these politicians who are obligated by their oath of allegiance, to service the interests of their Hausa-Fulani slavemasters against the overriding freedom of their own brethren. The same people they deceitfully claim to be representing but primarily centred on greed and selfishness. The IPOB for avoidance of doubt, has variously engaged in meetings with these men, to possibly find ways for peaceful co-existence and synergy but to no avail, proving the latter's desire to strengthen the targeted subjugative policies of the Nigerian government against their people. Premised on the criminal activities of these treacherous individuals, the leadership of the Indigenous People of Biafra (IPOB) therefore, with the irrefutable mandate of the Biafran people, resolved to PROSCRIBE all the intents and purposes of the Ohaneze Ndigbo and their political fellows within the Southeast region particularly and of course, the entire Biafraland in general.